In my opinion, the best breakfast consists of two perfectly fried eggs, crispy bacon, and toast made with a hearty bread. It is the breakfast you want when you have time to relax around the kitchen table, drinking a cup of coffee or two. My technique was learned from my mom, by watching her make our family's breakfast over and over again, year after year. Cooking eggs in bacon fat is easy and takes just a little practice to perfect. All you really need for a great bacon and eggs breakfast is a good nonstick skillet and a good toaster . If you want to make your own bread for toast, a bread machine like mine will make that easy as can be. 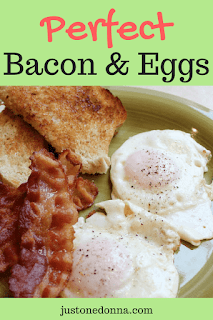 There are lots of ways to make bacon and I have tried them all, but I always come back to frying my bacon on the stovetop or in an electric frying pan . I usually choose the stovetop. Let the bacon sit out on the counter to warm up for 10-15 minutes before trying to separate the slices to make it easier to separate the bacon pieces. Using a large skillet, place the slices of bacon in the pan over medium-high heat. You don't want to crowd the bacon slices. If your bacon is spattering all over, the heat is too high. Cook your bacon, turning it every couple of minutes until it reaches the crispiness you desire. Drain the bacon on a plate layered with paper towels. Once all the bacon is cooked, turn your heat down to medium-low. Don't drain the bacon fat. You are going to use it all to fry your eggs. Keep a small bowl of bacon fat in your refrigerator to be sure you have enough bacon fat to fry the eggs. You want about 1/4 inch of fat in the pan. Use a slotted spatula to remove the eggs from the pan and then blot each egg with a paper towel before putting it on the plate. That way very little of the fat is actually served with the eggs. You want the bacon fat to be hot, but not so hot that the egg sizzles and crisps up around the edges. I mean, I don't want my egg that way, but it's OK if you do. Make your eggs how you want them. That's the beauty of cooking at home. You'll want your toast to be in the slots of your toaster, ready to start toasting as soon as the eggs go into the frying pan. The eggs should take about three minutes from pan to plate. That means you will want to start the toast as soon as you crack the eggs into the pan. The timing needs to be right if you want your toast hot, with the butter melting into its crunchy top. Use a hearty bread for the toast. My homemade honey-oat bread toast is perfect, but any good, store-bought brand will work as well. The toast is important to this breakfast, so buy the tastiest loaf you can find. Crack the eggs into the pan and start the toast. Let the eggs begin to cook for about 30-45 seconds. Then using a large spoon, start to baste the eggs with the bacon fat by scooping the fat over the tops of the eggs. You are not going to flip these eggs. The hot fat is going to cook the top of the eggs. Be careful while spooning the fat over the eggs. That bacon fat is hot! After about three minutes the eggs should look done, the whites will be firm, and the yolk will look partially cooked. Using a slotted spatula, lift each egg from the pan. Holding a folded paper towel in your left hand (if you are a righty) blot the underside of the spatula to absorb any dripping fat and lightly blot the top of the egg. Place the eggs on the plate, sprinkle generously with salt and freshly ground pepper. Add the buttered toast and bacon...and enjoy. Yes, it is the perfect bacon and egg breakfast. Yum! Want more bacon and egg breakfast ideas? Try this recipe for spiced bacon. Good herbal salt does wonders!